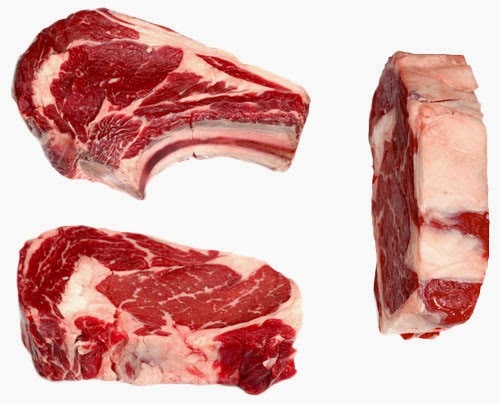 There are many, many different cuts of meat that we're all familiar with, and we each probably have our own favorites. The list seems almost endless... ribeyes, filets, chops, strips, etc. But this week we introduce a new cut that even I had not come across previously. Within the next few days, we'll feature a hand cut ribeye filet. You're probably well aware of how meaty and flavorful a ribeye is... or how tender a filet mignon is. In this case, you're getting a bit of both. And it all begins with the ribeye cap. So what exactly is a ribeye cap? Take a look at this ribeye steak. There's the bone; then there's the large eye of meat attached to it. then around that eye of meat is the spinalis dorsi, also known as the ribeye cap. If you trim it off from the ribs before cutting them into steaks, you end up with an entire muscle about 16 inches long, 8 inches wide, and an inch thick. Now that you've endured a brief tutorial on Meat Cuts 101, we think you're ready for a bite. We're still working on the final ingredients and seasonings, but soon you'll be able to experience the best of both worlds... all on one plate!